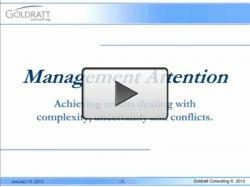 In this webinar, Rami Goldratt masterfully presents some insights to the latest development of the late Dr. Eliyahu M. Goldratt: The Science of Management. Using the five focusing steps he explains how we can achieve the desirable outcome when dealing with elements of reality such as complexity, uncertainty and conflicts. Throughout the presentation he also makes reference to the application of these insights to the Education field and the challenges faced by education when looked from this perspective. This entry was posted in TOC.tv, TOCICO, Videos and tagged goldratt, tocico, videos. Bookmark the permalink.